The team's Week 5 victory highlighted a memorable weekend for a number of fans, including Steelers Nation Unite members whose game day experiences were elevated to another level. Leading up to last week's game, Steelers Nation Unite gave fans a chance to win a VIP Experience in Pittsburgh for Week 5, which included access to the Rock Steelers Style Event on Friday, Oct. 5 at Stage AE, game tickets and a pregame on-field experience. Tomeika Slappy was the lucky Steelers Nation Unite member who received a weekend with the Steelers that was beyond what she ever could have imagined. "I don't even have words for this," Slappy said during pregame on Sunday. "It's been beyond amazing. This whole experience has just been awesome. I just love the things the team does for their fans." Slappy was not the only member, though, who had a memorable experience from Steelers Nation Unite. 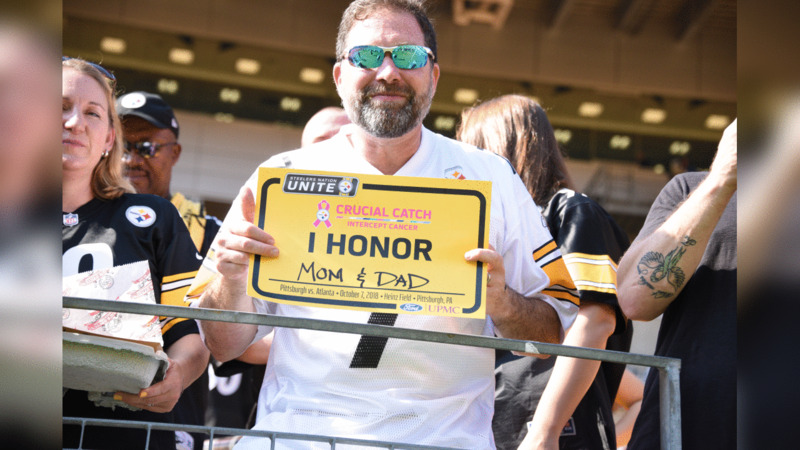 Each week, a fan is selected to be recognized on the scoreboard as the "Steelers Nation Unite Member of the Game." As part of the team's Crucial Catch game on Sunday, the in-game feature had a special presentation with it. Lori Kuhn of Mt. Pleasant, PA is a Steelers season ticket holder. Her sister, Barb, is a breast cancer survivor, who was declared cancer-free in June of this year. When Lori heard that the team wanted to recognize cancer survivors on Sunday, she knew she wanted her sister to be part of it. "[The team] reached out and said Steelers Nation Unite was looking to honor someone this week and asked if Barb could be considered for it," Lori explained. "We found out that it was a go and I called Barbara and we were both really excited about it." For Barb, her sister's act meant a great deal and made for an incredibly memorable day. "I was so touched. She was with me the whole way through cancer, along with my girls, so [Sunday] was icing on the cake," Barb explained. "She's done stuff like this for me the whole way through my treatment. We're huge Antonio Brown fans and it was great to get a jersey. I just want to thank the Steelers organization for all of it." In addition to the Antonio Brown jersey, both Lori and Barb also received Crucial Catch gear packages, as well as postgame field passes. Throw in the win, and it really was "icing on the cake," as Barb put it. To see more about how Steelers Nation Unite recognizes and rewards fans all year-long and all around the world, visit SteelersNationUnite.com now. Free to join, the Official Home of Steelers Nation keeps fans connected with exclusive content, one-of-a-kind experiences and great rewards that can only come from the team. Check out the top fan photos from game day and the Steelers Nation Unite experiences at Heinz Field during the team's Week 5 matchup with the Falcons.